48% of young people's cancer cases in the UK are in males, and 52% are in females. Young people's cancer incidence rates (European age-standardised (AS) rates ) for males and females combined are similar to the UK average in all the UK constituent countries. Data is for UK, 2013-2015, ICD-10 C00-C97, D32-D33, D35.2-D35.4, D42-D43, D44.3-D44.5. All young people's cancers includes all malignant tumours (ICD-10 codes: C00-C97), and all benign/uncertain or unknown behaviour brain, other central nervous system and intracranial tumours (ICD-10 codes: D32-D33, D35.2-D35.4, D42-D43 and D44.3-D44.5). 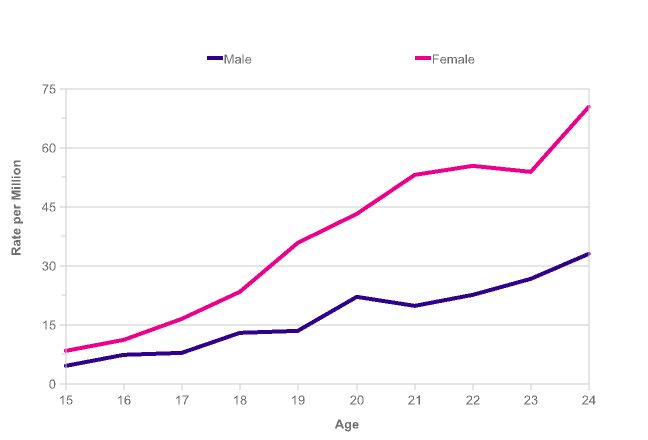 The incidence of all cancers in 15-24 year-olds increases with age, with the majority of cancers being diagnosed in those aged 20-24 (62% in the UK between 2000 and 2009) compared with 15-19 (38%). In males, the age-specific incidence rates rise from 188 per million in 15 year-olds to 329 per million in 24 year-olds, and in females from 154 to 368 per million, respectively. The age distributions vary considerably depending on subtype, however, with cancers showing various combinations of increases, plateaus and decreases in age-specific incidence rates across the age range. The largest rise in incidence between the ages of 15 and 24 occurs for cervical cancer with more than a hundred-fold increase in rates (from less than 1 per million in 15 year-olds to 56 per million in 24 year-olds). The incidence rate for female breast cancer also rises dramatically with age with more than a fifty-fold increase in rates (from less than 1 per million in 15 year-olds to 22 per million in 24 year-olds). In males, the largest rise in incidence occurs for testicular germ cell tumours (GCTs) with a nine-fold increase in rates (from 12 per million in 15 year-olds to 107 per million in 24 year-olds). Other cancers showing large increases in incidence rates across the age range include malignant melanoma (seven- and eight-fold increases in males and females, respectively), and ovarian cancer (nine-fold increase). None of the cancers show dramatic decreases in incidence rates between the ages of 15 and 24, though several show modest declines (between three- and six-fold). These include osteosarcoma, rhabdomyosarcoma, Ewing tumours and Acute lymphoblastic leukaemia (ALL). In males, the largest decline in incidence across the age range occurs for osteosarcoma with more than a six-fold decrease in rates (from 13 per million in 15 year-olds to 2 per million in 24 year-olds), whilst in females the largest decline occurs for rhabdomyosarcoma with a five-fold decrease (from 3 to less than 1 per million, respectively). Data is for UK, 2000-2009, ICD-10 C00-C97, D32-D33, D35.2-D35.4, D42-D43, D44.3-D44.5. 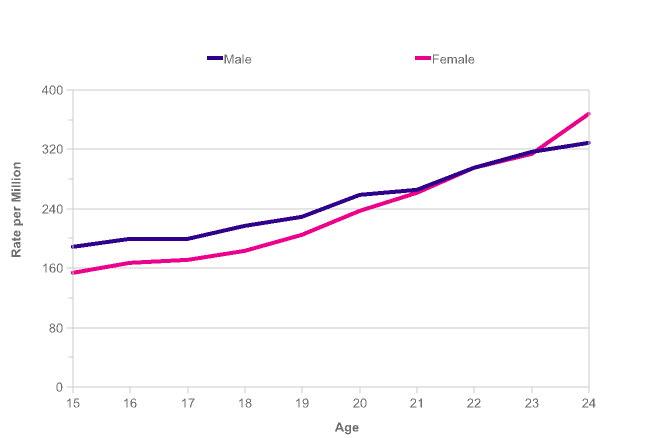 European age-standardised (AS) incidence rates for cancers in young people males and females combined increased by 33% in the UK between 1993-1995 and 2013-2015. [1-4] The increase was larger in females than in males. For cancers in male young people, AS incidence rates in the UK increased by 22% between 1993-1995 and 2013-2015. For cancers in female young people, AS incidence rates in the UK increased by 44% between 1993-1995 and 2013-2015. 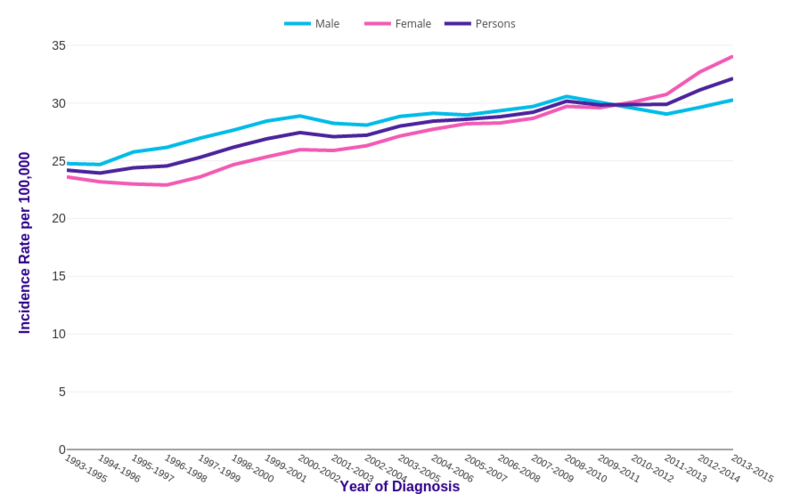 Over the last decade in the UK (between 2003-2005 and 2013-2015), AS incidence rates for cancers in young people males and females combined increased by 15%. [1-4] In males AS incidence rates remained stable, and in females rates increased by 25%. All young people's cancers for England, Wales and Scotland includes all malignant tumours (ICD-10 codes: C00-C97), and all benign/uncertain or unknown behaviour brain, other central nervous system and intracranial tumours (ICD-10 codes: D32-D33, D35.2-D35.4, D42-D43 and D44.3-D44.5. These trends include benign/uncertain or unknown behaviour brain, other central nervous system and intracranial tumours because they account for a relatively high proportion of cases in this age group. However trends for these tumours are unreliable pre-2000s, and largely reflect improved data collection rather than true increased incidence. Percentage increases since the late 1970s and early 1990s are very slightly smaller if these tumours are excluded. Data were provided by Public Health England Knowledge and Intelligence Team (North West) on request. Similar data can be found here: http://www.nwcis.nhs.uk/. Alston RD, Geraci M, Eden TO, et al. Changes in cancer incidence in teenagers and young adults (ages 13 to 24 years) in England 1979-2003. Cancer 2008;113:2807-15. Birch JM, Alston RD, Kelsey AM, et al. Classification and incidence of cancers in adolescents and young adults in England 1979-1997. Br J Cancer 2002;87:1267-74. Adamson P, Bray F, Costantini AS, et al. Time trends in the registration of Hodgkin and non-Hodgkin lymphomas in Europe. Eur J Cancer 2007;43:391-401. UK Association of Cancer Registries. Library of recommendations on cancer coding and classification policy and practice. Accessed February 2013. Data is for UK, 1993-2015, ICD-10 C00-C97, D32-D33, D35.2-D35.4, D42-D43, D44.3-D44.5. Cancers in young people are further classified into cancer type using the internationally accepted young people classification system, which also takes morphology into account. The classification divides young people cancers into ten cancer types (called diagnostic groups), with further subgroups and divisions. [1,2] It is similar, but not identical to, the system used for the classification of childhood tumours. The three most common cancer types in young people are lymphomas, carcinomas and germ cell tumours. Barr RD, Holowaty EJ, Birch JM. Classification schemes for tumors diagnosed in adolescents and young adults. Cancer 2006;106:1425-30. Steliarova-Foucher E, Stiller C, Lacour B, et al. International Classification of Childhood Cancer, third edition. Cancer 2005;103:1457-67. Lymphomas form the most commonly diagnosed group of cancers in young people overall, accounting for 21% of the total cancers in this age group. The numbers of cases are slightly higher in males than in females, with a male:female ratio of 12:10. There are two main types of lymphoma: Hodgkin lymphoma (also called Hodgkin’s disease), which accounts for around two-thirds (68%) of all lymphomas in 15-24 year olds, and non-Hodgkin lymphoma (32%). Data is for: UK, 2000-2009. See source for ICD codes and other data specifics. Carcinomas (such as of the thyroid, cervix, bowel and ovary) form the second most commonly diagnosed group of cancers in 15-24 year-olds overall, accounting for 20% of the total cancers in this age group. However, the numbers of cases are considerably higher in females than in males, with a male:female ratio of 3:10. 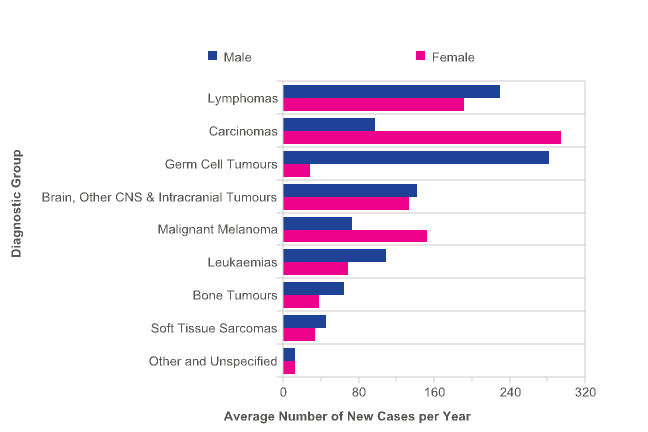 Hence carcinomas form the most commonly diagnosed group in females (accounting for 31% of the total) compared with the fifth most common group in males (9% of the total). This disparity is due to the much higher incidence of carcinoma of the thyroid in females compared with males, and the higher incidence of the female-specific carcinomas (cervix, ovary and breast). Germ cell tumours (GCTs) form the third most commonly diagnosed group of cancers in young people overall, accounting for 15% of the total cancers in this age group. Around 90% of cases occur in males, however, making it the most commonly diagnosed group in 15-24 year-old males (accounting for 27% of the total) and the eighth most common in females (3% of the total). Testicular GCTs make up the majority of this group, with the remainder being ovarian GCTs and GCTs of non-gonadal sites (such as in the pineal gland in the brain, or elsewhere in the head, neck or chest). Brain, other CNS and intracranial tumours form the fourth most commonly diagnosed group of cancers in young people overall, accounting for 14% (7.5% malignant and 6.5% benign, uncertain or unknown) of the total cancers in this age group. The numbers of cases are similar in males and females, with a male:female ratio of 11:10. This cancer type comprises a range of tumours, including astrocytoma, pituitary adenoma and craniopharyngioma. Malignant melanoma forms the fifth most common cancer in 15-24 year-olds overall, accounting for 11% of the total cancers in this age group. The numbers of cases are around twice as high in females than in males, with a male:female ratio of 5:10. Hence, malignant melanoma forms the third most common cancer in females (accounting for 16% of the total) and the sixth most common in males (7%). Leukaemia forms the sixth most commonly diagnosed group of cancers in young people, accounting for around 9% of the total cancers in this age group. The three main types in 15-24 year-olds: acute lymphoblastic leukaemia (ALL), acute myeloid leukaemia, and chronic myeloid leukaemia. ALL is the most common, accounting for 46% of all leukaemias in young people. This contrasts with leukaemia incidence in childhood, where ALL accounts for around four-fifths of the total (78% in Great Britain between 1996 and 2005). Data were provided by Stiller C (Childhood Cancer Research Group) on request. Bone sarcoma forms the seventh most commonly diagnosed group of cancers in 15-24 year-olds, accounting for 5% of the total cases in this age group. The numbers of cases are higher in males than in females, with a male:female ratio of 17:10. Osteosarcomas and Ewing tumours make up the majority of this group. Soft tissue sarcoma (STS) forms the eighth most commonly diagnosed group of cancers in young people (and the least common of the specified cancer types), accounting for 4% of the total cancers in 15-24 year-olds. The numbers of cases are slightly higher in males than in females, with a male:female ratio of 13:10. This cancer type comprises a range of tumours, including rhabdomyosarcoma, synovial sarcomas and nerve sheath tumours. A study of cancer incidence in 13-24 year-olds for the period 1979-2001 in England showed a general trend of lower incidence with increasing deprivation for all cancers. Differing associations were shown by cancer type, however. Incidence of leukaemia overall was highest in the most deprived young people, although there was no significant trend by deprivation for acute lymphoblastic leukaemia (ALL) and acute myeloid leukaemia (AML) separately; incidence of cervical cancer also showed a trend of higher incidence with increasing deprivation. In contrast, incidence of Hodgkin lymphoma, germ cell tumours (GCTs) and melanoma were all highest in the most affluent 13-24 year-olds. Alston RD, Rowan S, Eden TO, et al. Cancer incidence patterns by region and socioeconomic deprivation in teenagers and young adults in England. Br J Cancer 2007 96:1760-6.